Have you dreamed of success, yet so far have felt like it’s not quite attainable? Sometimes, our vision of success isn’t even fully discovered, much less something that is simply an end goal. My story of success is my own; unique to my personal situation. Yet the six principles that shifted my mindset may help you, too, see success in a new light. I had it all…kind of. If you’re like me, you probably have had a dream that you want to drive toward, and a certain finish line that will define when you have achieved your goal. We all have a picture of success in our minds that we strive to achieve. Some of these pictures are fully our own, some of the pictures are colored by the world around us. These may be based on our social or economic class we see ourselves in, our education and career choices or our friends and family’s traditions and expectations. All of these factors contribute to our version of what success looks like. I came to realize these as I was climbing toward my own version of success. My husband Nathan and I had worked our way to a great income, we were living in a perfect neighborhood that we chose, and found ourselves as integral parts of family and friend’s lives. These areas of our lives were great, and yet in order to maintain it, we needed babysitters and nannies, house cleaners and much needed breaks to keep all of our “success” afloat. What did we really want? What would truly make us happy? In your quest for “success”, what would it really mean if you achieved it? Is there that end moment where you believe you’ll stop, take a step back and say, “I have arrived” and simply bask in the glory? We weren’t there yet in our life – and so we did the next step on our own ladder of success – taking a week-long getaway for our 10 year wedding anniversary. We realized in the hustle and bustle of our daily lives that we had never actually left our children and done any getaway for the two of us, ever. So we flew to a resort in Cancun to relax and take a much needed break. While there, I devoured a delightful and thought-provoking book, The Fire Starter Sessions, by Danielle LaPorte. In it, a single question rocked our world. What is the feeling behind the goal? What a powerful question! It wasn’t enough to simply dream about a goal; but to dig deeper into what type of feeling that goal would elicit within us. And it started us on the most incredible journey of our lives. Have you ever considered this – to really dig deep into what emotions course through you as you sit in the seat of success? Or has it been so off in the distance you haven’t even considered what it would feel like? What goals did we have as a family? Well, honestly we didn’t have anything laid out. Think about it – we spend so much time in our work honing in on the vision and mission statements. Yet when do we ever discuss this for our personal lives? How often do we voice our dreams and expectations for what a marriage or family life will look like? And how many times does it just happen and we simply react to what comes our way? We needed a clear family vision. We needed some clarity on what we actually wanted as a family. And so we dreamed together. We brainstormed and shared our desires. We wanted to explore and learn. We wanted to foster respect and love. We desired to connect with and listen to others. And thus we created our family vision: Explore, respect. Listen, connect. Learn & love. We had a vision. We had a goal. “One day,” we wanted to explore beyond this place we knew so well. We dreamed of travel – all of us. And guess what? It will always remain “one day” until you put a date on it. What visions and dreams do you have for your family? Have you ever taken a moment to share it with them – to see if you all are on the same page? It’s amazing the insights you can glean even from your youngest children about what they envision true happiness to be. If you haven’t, ask your family members what they think of when they dream of family. A biggie with dreams is this. They will always stay off in the distance until we make it quantifiable and concrete. It’s not enough to simply dream about “one day” making it happen. We watched so many around us working hard for “one day”…and by the time it rolled around, their relationships were severed or strained, health had suffered, or worse yet, that time never actually came for them. We chose to make “one day” happen now. I came home from that ten-year anniversary trip and booked a flight for the whole family to go to Costa Rica. For a month. Yes, a full month. I gave us 8 months to plan (this was a big leap for us)! I wanted to give that opportunity for us to live out our family vision in a place we dreamed of going to, and allow plenty of opportunity for us to pull out of our norm and experience something different. And while we were there, we started playing with additional ways to leverage our assets by AirBnBing our home. The money we made in renting it out for twelve days paid for our lodging for the month in Costa Rica. We came back on a mission to not simply wait around for the next getaway. This was a true lifestyle shift. For our “one day” trip to happen, it required us to think outside the box. So often the stresses of money prevent us from taking these big adventures, but by looking at other ways of leveraging income while we were gone, eating family-style and cooking our own meals, and finding joy in free things to do, the trip became much more feasible. What possibilities do you have right under your nose to help you with your goals? Maybe it’s renting your home out while you travel, or selling those things cluttering your home and using that income as a nest egg for that business or trip, etc. you want to do. Moving toward your dreams of success don’t mean that when you’re there, you’re limited. Look for ways to keep the money coming in, ease it into your every day, and not just save up for a “there and gone” moment of bliss. Let’s go back to those feelings behind the goals. While in Costa Rica, we experienced awe, wonder, gratitude, excitement and curiosity. With the new sights and the lack of internet and push-button entertainment, we were completely sucked in to the present moment. We found pleasure in the simple things, and recognized the beauty in simply being; not doing every touristy attraction, but getting to know the locals and enjoying nature and simply connecting as a family. What we found was that, while we couldn’t bring the gorgeous sunsets, beaches and rainforests back with us, we could bring back the mindset. Sometimes, when you slow your pace, soak in the moment, and look at things with fresh eyes of gratitude and curiosity, the location isn’t as critical. Don’t just count down the days until your adventure or that end goal. Look at how you can foster that mindset throughout your daily life. Because ultimately, it’s not about just where you are, but the mindset shift that takes place and allows you to appreciate it. In October of 2016, we moved our family into a 240 square foot travel trailer and hit the road. We started with a simple 90 Day Family Road Trip. And that, my friends, broke the glass ceiling of what we believed was possible for us as a family. It was no longer about a success status of a bigger home, a certain amount in the bank, or some other end goal we would “one day” attain. It was living now in the present moment, and finding gratitude in simply what is. And, it was pursuing where we wanted to go and who we wanted to be. The house that once loomed over me with clutter and an ongoing “to-do” list became another stream of income for us. The “keeping up with the Joneses” obligations fell by the wayside as we became so enamored with the closeness we felt as a family. We cared less and less about obligations and agendas and more and more about the authentic relationships of positivity and light that saved our sanity. And we adventured. Oh, have we adventured. Success is an ongoing evolution, as we embrace the journey along the way. 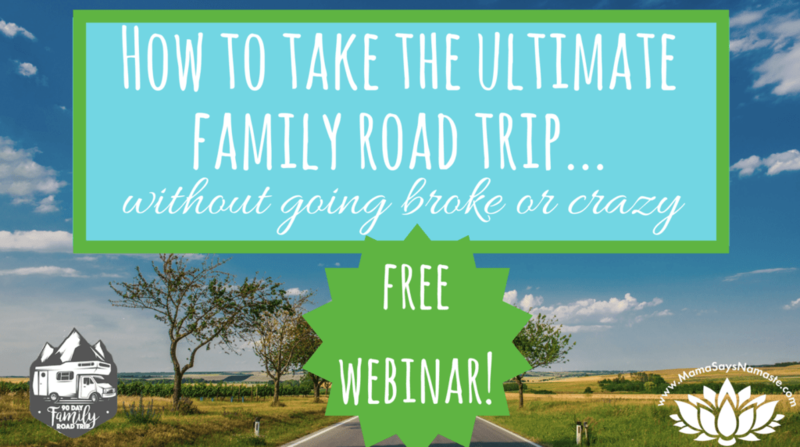 You can learn how to go on the ultimate family road trip here. It’s not just about my story. Have you considered how you define success? What does success really look like for you? Is it in an accomplishment (like a big house or bank account) or in a connection (like your children actually wanting to spend time with you)? Identify the feeling behind the goal – don’t just go for the first dream you have. Keep asking yourself why. Dig deep into it to identify what emotion you are desiring. Get clear with your vision – discuss your dreams with your family. Sometimes we don’t even realize the dream ourselves because we haven’t taken the time to consider it. Identify what you want, and then voice it. When you voice it, you have the opportunity to come together to create a common vision where every family member thrives. Think beyond “normal”. Maybe what you want just isn’t feasible in the present moment – like dropping everything and moving to a new country. But maybe you can incorporate a bit more of that culture into your life here by learning the language, going to cultural education centers, and exploring some of the dishes that are from that area. Look for “and” possibilities. As you look beyond the box, explore other options that are a bit more creative. We wanted to travel as a family, and yet when we started to look into more international travel, we hit an obstacle because we have a dog. That’s when we started looking more seriously into RVing, where we could easily have our pup accompany us on our adventures. So it wasn’t “travel or have a pet,” but an “and” where we got both! Get that “adventure mindset”. Go back to those emotions you want to foster, and don’t wait until that date to start building those into your life. Look at a lifestyle that really captures those moments now. Create that “adventure mindset” that allows you to find the joy in the journey, not just craving that end goal. As I write this, we’ve spent 2 years and one month on the road. We’ve seen 48 states and had more “once in a lifetime” moments than I ever imagined. And the journey continues. Success was the epic 8-mile hike in Glacier National Park where we took in the most breathtaking views. Success was banding saw-whet owls in Virginia, surrounded by Amish “family” and being in a whole community of people who cared about the impact and relationship between two species – and us playing a positive role in supporting the migration of these owls. Success was my five year old facing her fears and learning to swim in the hot springs in Costa Rica, and testing her limits at every pool, spring and beach we landed at all across the US. Success was my 8 year old going from severe stuttering to perfect speech, not because of therapy and her changing her ways, but from us slowing down and truly being present with her. Success is broadening my reach to be able to connect with families across the globe virtually vs. being confined to just what is in my local area. And success is the fact that I truly am happy, full of love and light, eager to continue learning and also feeling like I’m exactly where I need to be. Because ultimately, success isn’t the same for every person, and it’s a path you take as you come back to your true self and love who you have become. Where are you with these six principles? Can you identify each of these in your own personal success story? If not, what step are you going to focus on today? 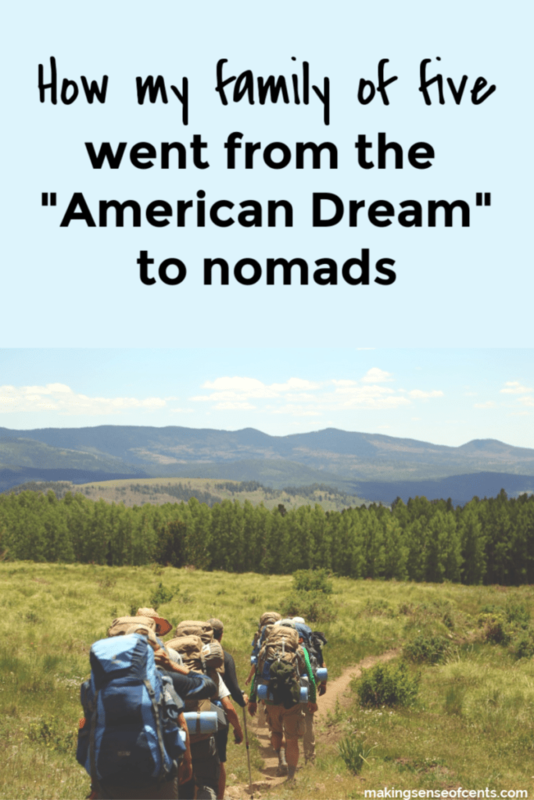 The post How my family of five went from the “American Dream” to nomads appeared first on Making Sense Of Cents.